Load­ing con­tain­ers in 10 min­utes. Or the push of a fin­ger. Every 9 min­utes a con­tain­er is being loaded or unloaded with SIMPLY – world­wide. Con­tain­ers can solve all logis­tics prob­lems. Except for one: Load­ing them. A bril­liant idea can par­tic­u­lar­ly be turned on its head when it comes to heavy and bulky items. World­wide stan­dards and sys­tems are replaced by on-site impro­vi­sa­tion, requir­ing fork­lifts and staff inside the con­tain­ers secur­ing the items with their bare hands. And being exposed to numer­ous risks. Not to men­tion the time wast­ed. Because any con­tain­er that’s not in motion costs mon­ey. So it’s high time for a new stan­dard: A con­tain­er-load­ing sys­tem. Thought through from A to Z. Easy to manoeu­vre – and even eas­i­er to oper­ate. The SIMPLY con­tain­er-load­ing sys­tem pro­vides exact­ly that. After press­ing the but­ton, it’s only anoth­er 10 min­utes before the truck can dri­ve out of the yard. SIMPLY offers impres­sive ser­vices. Its load-bear­ing capac­i­ty is 30 tonnes. You can use it world­wide, and that’s very flex­i­ble. Apart from space, all you need is a con­nec­tion to a high-volt­age pow­er cur­rent. The rea­sons for this can be sum­marised in one sin­gle word: Prac­tice. 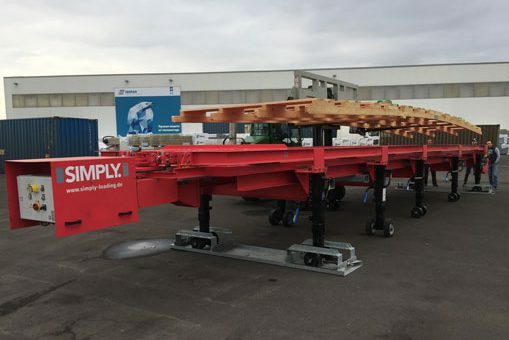 SIMPLY was devel­oped and designed based on the require­ments of a com­pa­ny ship­ping heavy, unwieldy flood-pro­tec­tion sys­tems all over the world. But no mat­ter what the spe­cif­ic case, the focus was on swift­ly and reli­ably ship­ping prod­ucts the rest of the world was wait­ing for. And that’s why SIMPLY is a con­tain­er-load­ing sys­tem designed for all con­ven­tion­al mar­itime con­tain­ers. SIMPLY itself is of course eas­i­ly shipped by con­tain­er! And this pays off when it comes to time-lim­it­ed projects. Because the first thing sup­pli­ers do then is send a SIMPLY to their cus­tomers by con­tain­er. The cus­tomers in turn use it to unload the goods, enjoy­ing advan­tages in terms of safe­ty, han­dling and time! SIMPLY is then just sent back at the end of the project. SIMPLY is a con­tain­er-load­ing sys­tem con­sist­ing of very few com­po­nents, mak­ing it more reli­able and flex­i­ble. And each of these com­po­nents is extreme­ly sophis­ti­cat­ed. Which boosts SIMPLY’s effi­cien­cy – and your sat­is­fac­tion. SIMPLY is based on a frame with cross­bars. It is made from sol­id steel and designed to han­dle the heav­i­est of loads. It is also weath­er­proof, since auto­mat­ic con­tain­er-load­ing sys­tems need to be able to guar­an­tee long-term, reli­able oper­a­tion even out­doors amongst the ele­ments. The frame’s sup­ports sit on cas­tors, and are also height and side-adjustable. Pow­ered elec­tri­cal­ly upon request. The trans­port frame sits on the base frame­work. It moves in and out of the con­tain­er. It too is made from sol­id steel, but is just nine cen­time­tres high in order to opti­mise load height. The trans­port frame push­es the load-bear­ing pal­let into the con­tain­er, and then slides back under it. To do this, it is first hoist­ed by air bel­lows, of which there are twen­ty-one in total. The frame is pow­ered by a chain; the engine has an out­put of 1.5 kW and a nom­i­nal volt­age of 400 Volts. The pal­let is made of wood, and is even easy to build your­self, depend­ing on the size of your load and, of course, the con­tain­er. 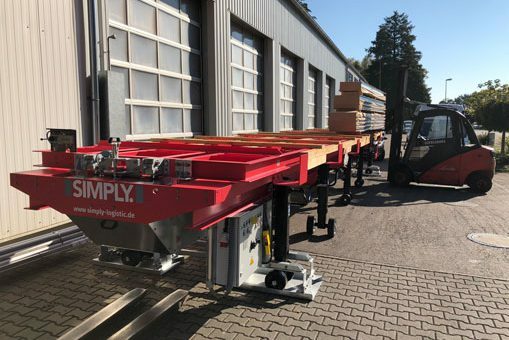 This makes it easy and safe to pick the load out­side the con­tain­er or before the con­tain­er even arrives, sav­ing time, spar­ing nerves, and, most impor­tant­ly, avoid­ing the need to have fork­lifts and staff inside the con­tain­er. 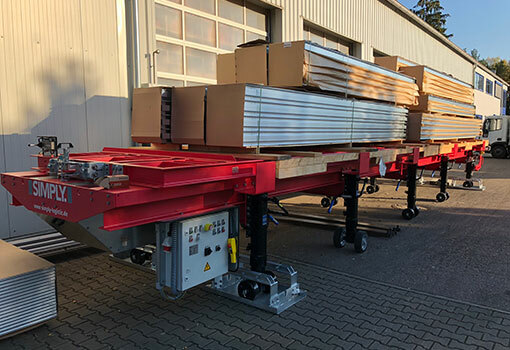 You can choose to either hoist the pre-picked pal­let onto the auto­mat­ic con­tain­er-load­ing sys­tem or pick the pal­let direct­ly on the trans­port frame. Con­tain­er-load­ing. A process that requires a grand total of one staff mem­ber! And even they don’t have much to do. 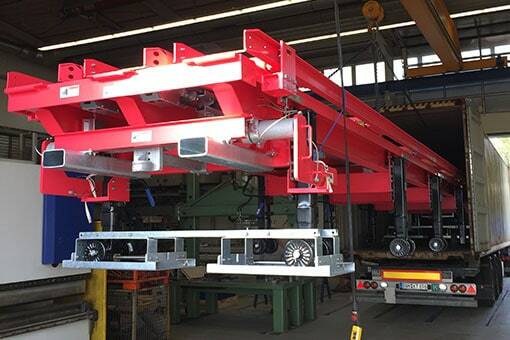 The truck revers­es up to SIMPLY and uses its lev­el adjus­tor to elim­i­nate any dif­fer­ences in height. Once the under edge of the con­tain­er reach­es the same height as SIMPLY, tai­lor-made fas­ten­ers are plugged into the stan­dard­ised cor­ner fit­tings and affixed with a ten­sion screw. The com­pressed air for the air bel­lows is then con­nect­ed and the con­tain­er length select­ed on the switch box. The rest is a press of a but­ton. The air bel­lows hoist the trans­port frame, which trav­els into the con­tain­er with the load, before auto­mat­i­cal­ly slid­ing back out again. The con­tain­er doors can then be shut and the truck can head off. The whole thing has tak­en ten min­utes. In short: The tech­nol­o­gy is like tak­ing a penal­ty kick. With­out a goal­keep­er. If the most dif­fi­cult and tedious part about ship­ping bulky, heavy items is the con­tain­er-load­ing process, it should be made the eas­i­est instead! SIMPLY’s mot­to is: Push the but­ton. Load and go. Sen­si­tive or frag­ile sec­tions can be secured has­sle-free – out­side the con­tain­er, in ide­al con­di­tions in terms of light­ing and space. SIMPLY is an auto­mat­ic con­tain­er-load­ing sys­tem that ensures your prod­ucts reach your cus­tomers faster. As effec­tive­ly as SIMPLY oper­ates, its core prin­ci­ple is to make con­tain­er-load­ing as easy as pos­si­ble. 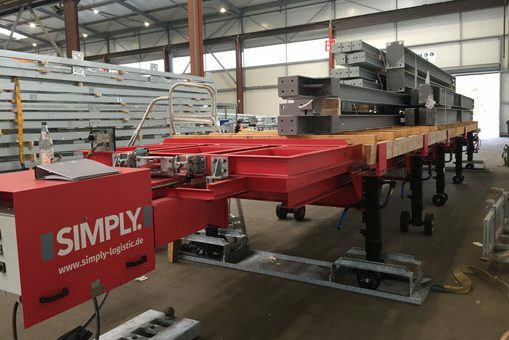 SIMPLY doesn’t use any ramps, extra floors, laser scan­ners or hydraulic mech­a­nisms to load goods into con­tain­ers. SIMPLY only offers what you need. But it does it right! Load­ing bulky, heavy goods into a con­tain­er can be a risky busi­ness. And if staff have to man­u­al­ly fas­ten parts weigh­ing sev­er­al tonnes in dim light­ing, or indeed manoeu­vre a fork­lift in the con­tain­er, the risk of acci­dent increas­es ten­fold. SIMPLY elim­i­nates these risks. No peo­ple means no injuries. 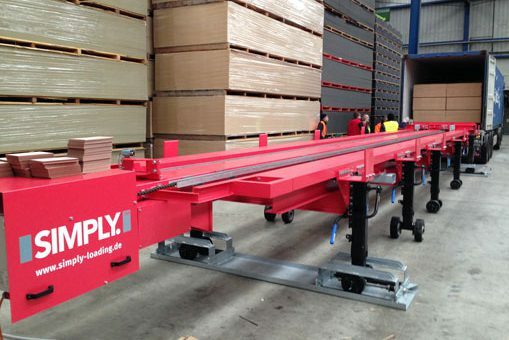 That’s how easy safe­ty can be with an auto­mat­ic load­ing sys­tem. You don’t have to wait for the truck to arrive in order to start load­ing; you can plan your time and staff place­ment flex­i­bly. With SIMPLY, you won’t even need a main­te­nance con­tract. Its main com­po­nents are made from sol­id steel, and the sys­tem is high­ly resis­tant and weath­er­proof. So you can eas­i­ly per­form your repairs and main­te­nance in-house. Exam­ples where SIMPLY was just the per­fect solu­tion. A cable rail­way con­sists of a num­ber of bulky col­umn ele­ments, cab­ins and pul­leys. And of course, mechan­i­cal com­po­nents which also need to be pro­tect­ed. Cou­pled with this is the fact that build­ing cable rail­way is always project-man­aged, mean­ing com­pli­ance with dead­lines is a top pri­or­i­ty. 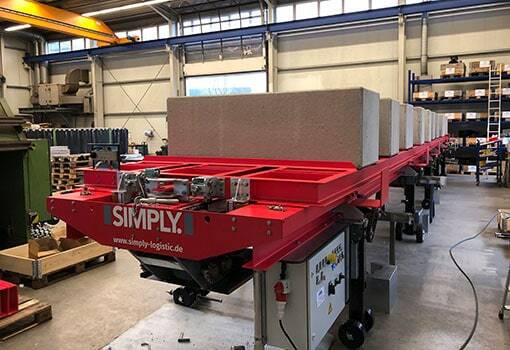 As such, the parts need to be sent quick­ly, and also unloaded quick­ly at their des­ti­na­tion, which is why mul­ti­ple SIMPLY sys­tems are used here. 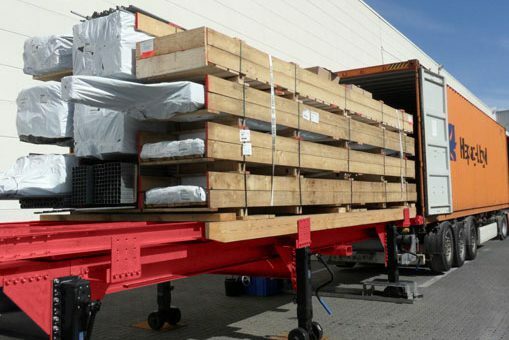 For load­ing at the pro­duc­tion site and for on-site unload­ing all over the world. This process has been prov­ing suc­cess­ful for years. There’s no way a com­bine har­vester will fit in a con­tain­er. But what about com­po­nents like coil­ers, feed screws and, most impor­tant­ly, cut­ter bars? Which are large and also sen­si­tive in parts. SIMPLY has proven to be par­tic­u­lar­ly effec­tive here in ensur­ing each indi­vid­ual piece is pro­tect­ed and reach­es the cus­tomer intact. Many man­u­fac­tur­ers sim­i­lar­ly do not send uncoat­ed met­al, but rather var­nish their prod­ucts. Pre-pick­ing pays off in these cas­es too. Con­tain­ers rev­o­lu­tionised logis­tics. 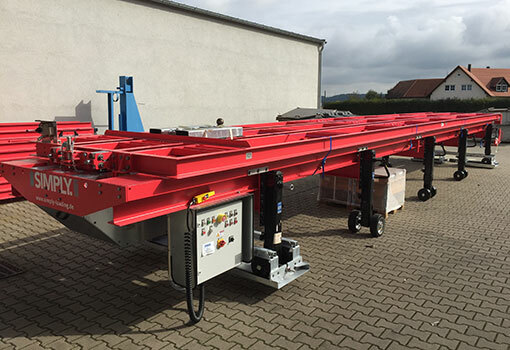 It’s now time to make the first link in the val­ue chain – the load­ing process – just as effi­cient. The system’s speed has proven to be extra­or­di­nar­i­ly prof­itable. Because it’s not just the load­ing times that are reduced, but also the han­dling times! You can sim­i­lar­ly save on open-top con­tain­ers – depend­ing on route, they are between 600 and 1000 Euros com­pared to stan­dard con­tain­ers. You your­self will be able to clear­ly see the point at which SIMPLY puts you back in the black. And the reli­a­bil­i­ty and increased work safe­ty will of course pay off for your staff too! A faster load­ing process means they will be avail­able for oth­er tasks in short­er time. The pur­chase price hap­pens to be com­par­a­tive­ly low. Con­tact us to find out more.